As the holidays approach and you’re getting ready for the big “baking season”…get your baking pans and cookie sheets ready with a good scrub. Mix up 1/4 cup baking soda with enough peroxide to make a paste…won’t take much peroxide. 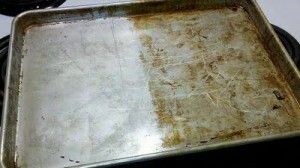 With a sponge, get to scrubbing those pans! Find this great trick over at One Good Thing. Thanks Mary for emailing this tip! I tried this, it works great! It did Not work for me! 🙁 Maybe my pans are Too bad!?!?! I saw this on pinterest, hope it works! I haven’t tried this, what about the baking soda and white vinegar mixed together? I’ve used plain baking soda and baking soda with vinegar….both with great results on lots of surfaces, but don’t expect it to get out all the stains from years gone by on every single pan.